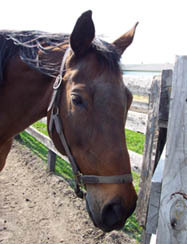 Cloud Harbor - Thoroughbred Racehorse - Now Retired and enjoying life as a broodmare. 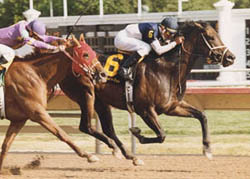 This picture is Cloud winning a race at Arlington Park Racecourse in Arlington Heights Illinois. 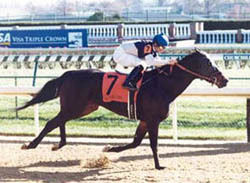 Cloud Harbor breaking her maiden at Churchill Downs in Louisville, Kentucky. 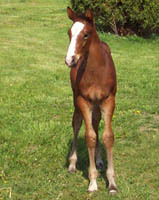 This is Sadie Hawkins, she was my children's and junior hunter in her younger years. I won many championships with her. She had been enjoying the life of retirement out at the farm. She got turned out everyday and gos treated like the Queen that she wass!! Sadly we had to put Sadie to sleep 10/23/08. 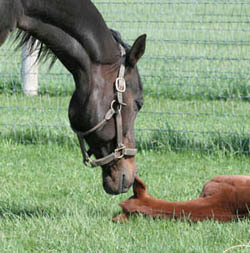 She is now in horsey heaven. Ok so this isn't the best picture of Sadie but she was out sleeping in her paddock when I took it. The rest of the time she was trying to eat the camera. She thinks everything is a treat! Marsha Marsha Marsha - Thoroughbred mare. She did not like the track to much, but has now gone on to a new career as a show hunter and loves it. She moves and jumps a ten! She has many championships in the children's hunters with her new owner! They are now doing the 3'6 hunters with her and from what I hear she is doing pretty well. 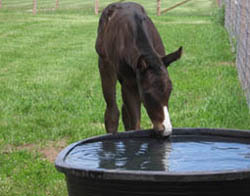 We always try our best to find out retired racehorses a good home after their time at the track! This was the old man. 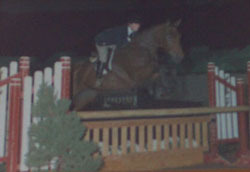 His name wass All That Jazz and showed for many years in the A circuit hunters. He then retired and came to live with me. He had the best canter ever!! You could canter him all day. 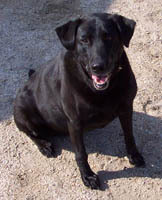 Sadly Jazz had to be put to sleep in 2008. 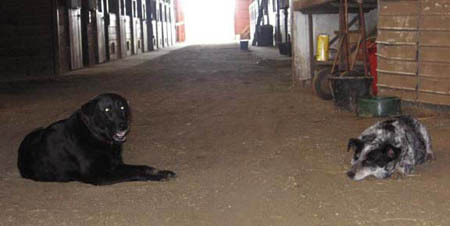 He is now in horsey heaven with his old girlfriend Sadie. 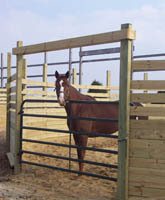 Kenneth - Thoroughbred Gelding - Kenneth went to knew owners that where going to run him a few times out east and then bring him back to retire him in Illinois at our farm. They ran him more than a few times and then sold him to another trainer that ran him as well. I think the last time he ran was 2005 or 2006 he would have been about 12 or 13 then. 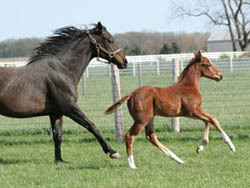 He last ran in Ohio. I am hoping he ended up retired in a good home. If anyone happens to know where he is drop me an email please and let us me know. He was a great horse and I would love to know where he ended up!!! I tried a bunch of times to contact his trainer to say I would take him back for retirement but I was never able to get a hold of his trainer/owner. 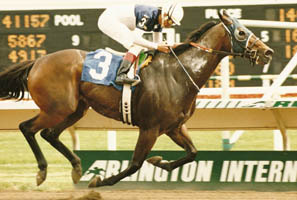 Shown winning at Arlington Park. 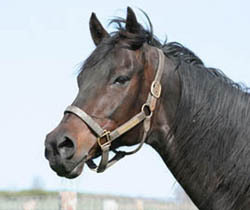 Fortunes of Gold - Thoroughbred Gelding. 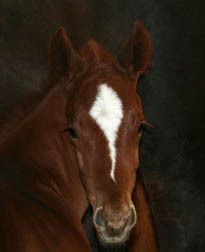 He was my first winner - Hawthorne Racecourse. We claimed him and then when we ran him back he won and was claimed from us. We tried to claim him back a couple of times but we where one of many so we never did get him back. I haven't seen him entered to run in years so again I hope that he went to a good home and is having a happy retirement from racing! 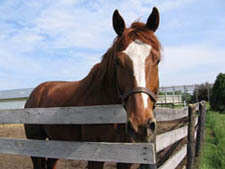 Bandit - He is a Appendix Quarter horse and the life of the party. 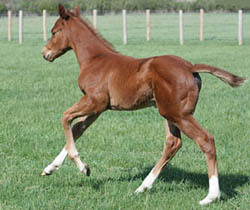 He tried to be a racehorse but just did not like it to much. So now he is trying his hoof in the Hunters and Jumpers. He can jump a house! He is the biggest character!! He will stick his noise in his fan so it makes all kinds of noise just so you come see him! 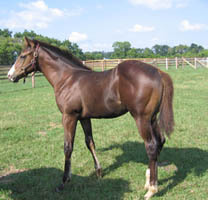 This is "John Said" - Thoroughbred Gelding by Regal Code out of a Known Fact mare. These are pictures from last year when he was a baby. 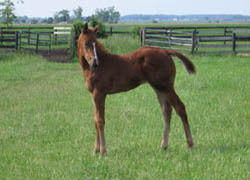 He is now a yearling and getting taller everyday. 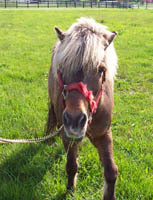 This is Pokey the barn pony. He is a shetland (can't you tell?) He is the best little pony. 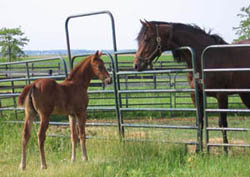 He baby sits all of our foals when they get weaned from their moms. He puts up with a lot of @#@#@! God only knows how old he is but I would guess in his thirties. 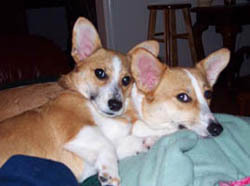 Bug & Molly - Barn Dogs - Molly is no longer with us......she was the best little barn dog!!!!!!!! 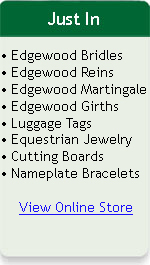 Looking for horse show awards, tack or equestrian gifts? 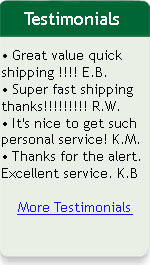 Check out our online store today!